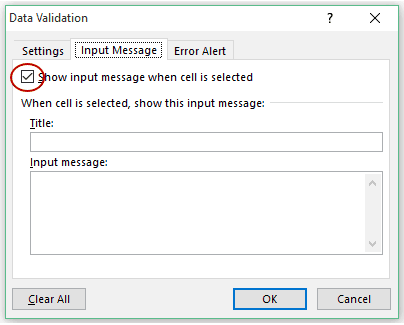 Input Message in Excel can be used to show a message when a cell is selected. It is particularly useful if you want to show some instructions to the user when he/she selects a cell. Examples could be to display form filling instructions or data entry instructions. Can’t this also be done using comments in cells?? – Well Yes! Yes, you can use cell comments as well. The only drawback with comments is that it is displayed only when you hover the mouse over the cell. On the other hand, you can use Input Message in Excel to display a message whenever a cell is selected (using either mouse or keyboard). Select any cell and then go to Data tab –> Data Validation. 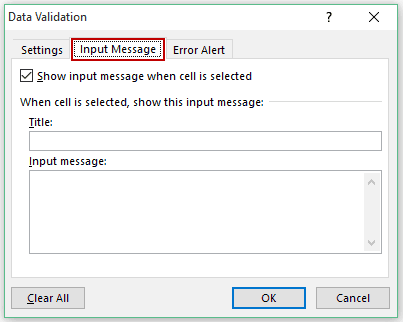 In Data Validation dialogue box, select Input Message tab. 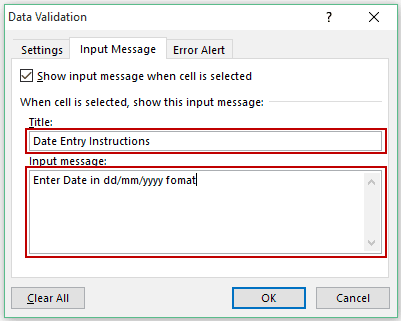 Ensure that “Show input message when cell is selected” check box is selected. In the Input message tab, enter Title (max 32 characters, optional) and Input Message (max 256 characters). Now whenever you either click on the cell or select it using the keyboard, it would display the message. How to create a drop-down list in Excel. 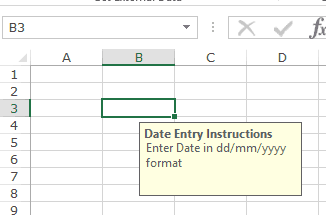 How to Enable Conditional Data Entry in Excel using Data Validation. 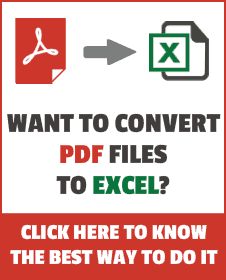 Creating and Using Excel Data Entry Forms.